Design is simply about communicating ideas. And a product or service is simply a vessel to carry those ideas. Consumers are looking for products or services that not only solve a problem but express something about who they are. At Ashcraft Design, we like to capture the attitude and character of the people we design for and channel it through our client’s product or service. Successfully communicating that idea through a product or service is accomplished through a detailed process of observation and discovery. Good design puts these ideas into action through careful execution of every detail. Without this proper execution, the idea has no value. Good design turns these ideas into tangible experiences that consumers love. Understanding how ideas can turn into experiences consumers love, led us to look into the headphone market. It was over saturated and there was a huge opportunity to carve out a unique niche. So to capture the emotion of the consumer and stand out from the competitors, we created Aria. 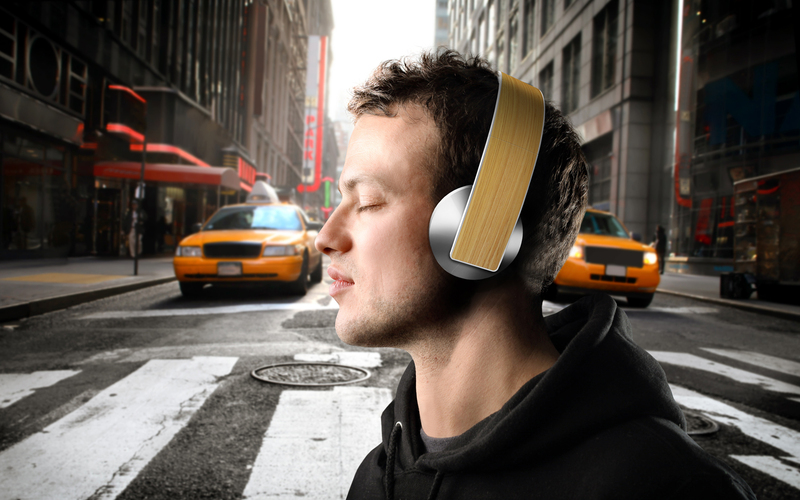 Aria is a pair of eco-friendly headphones made for people who truly love music. The head band Aria is wrapped in wood reclaimed from the acoustic guitars of famous musicians. The satin spun finished ear cups are made from recycled aluminum from beer and soda cans found at different shows and venues. The quilted leather surrounding the ear cups and the lining comes from reclaimed bags, jackets and other articles of clothing from these musicians. The instant the consumer touches the headphones, they will feel an instant connection to the musician through the use of these upcycled materials. Initially, Aria was designed to be a limited production run (due to the scarcity of musicians guitars and clothing) that would be auctioned off and the proceeds given to a music based charity such as one dedicated to raising the awareness about the importance of music as a part of a child’s education. The limited production run will be followed by a full production run of the Aria headphones with mass production ready sustainable materials such as bamboo, recycled aluminum and plastics but not the actual items from musicians. More images . Through the use of materials and ideas, we conveyed deeper meaning than any physical beauty or function alone could. It gave the consumer the opportunity to be a part of something much more intimate. This is what drives people to become advocates of brands. At Ashcraft Design we build brands through ideas that resonate with consumers to significantly impact business growth. Our unique vision and understanding of how to use design to create accessible aspirational products and services builds brands consumers love. Check out some more of our work to see other ways we connect with consumers and grow brands.